Let me explain what I mean by borrowing from the Russians: A Russian way to eat caviar is on blini (buckwheat crepes) with sour cream, red onion, and diced hard cooked egg. We had this in a restaurant and loved it. 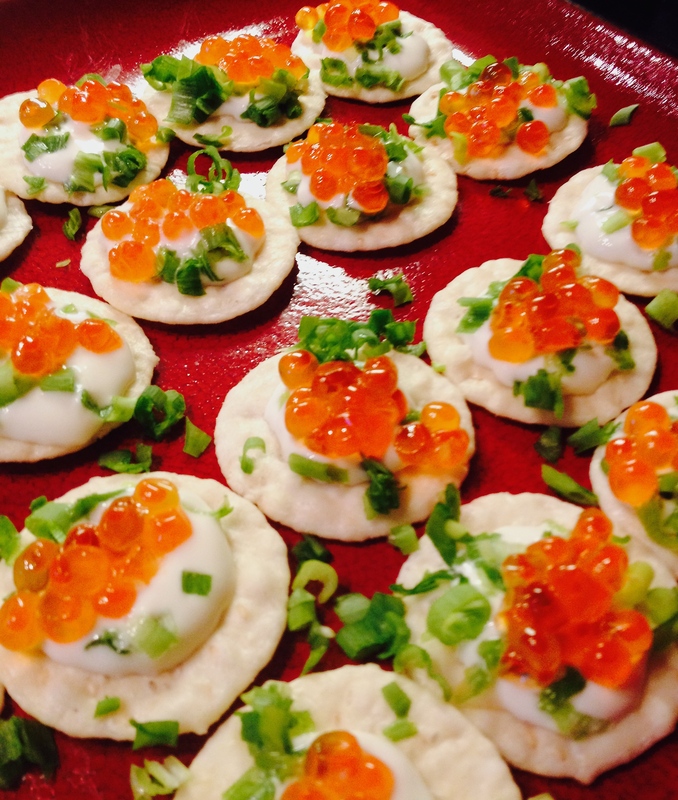 Inspired, but knowing making blini is an involved process, I came up with sesame rice crackers, sour cream, and chopped green onion. If you feel like sprinkling on some finely-diced hard-cooked egg too, by all means. It’s swell! Stir your sour cream well so it’s nice and smooth. Spread a small spoonful (like 1/2 tsp) of sour cream on each cracker. Sprinkle each with sliced green onions. Top each with a small dollop of caviar. If you like, grind some fresh black pepper over the tops. DONE! I told you it was easy. Admire and eat!